This indispensable text has been updated to include a variety of contemporary topics, case studies, legal trends, and new Ethical Dilemma scenarios designed to strengthen critical-thinking skills. 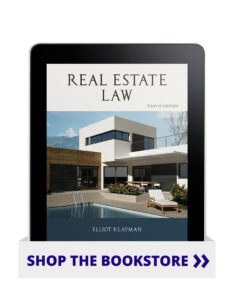 Contemporary topics such as stigmatized housing, fracking, seller assist, constitutional taking, green development, and other key concepts are discussed in a straightforward, easy-to-read style. Learning objectives, case studies, review and discussion questions, and suggested readings are just a few of the learning tools used to enhance student understanding.